We often find ourselves invited to respond to people who ask us for money on the street. Beggars, homeless people, buskers and charity collectors, and so on. We can respond in different ways: give them something, decline as a matter of course, decline as a matter of principle, not notice them, establish a set of principles that dictates to whom we shall give or refuse, keep a few coins to give to people who ask, intend to give coins only to discover that we have only notes, or act randomly depending on how we feel. The most common principles that may lead us to decline have to do with the probability that what we give will feed addiction, and that other people will have to deal with its human, social and environmental consequences. Whether we give or decline, we then have the choice of looking in the eye the people who ask us and so making our response personal, of entering into conversation with them, or of giving our money almost furtively with eyes lowered. When we walk on we can think no more about the encounter or we can wonder if we have done rightly and chat with friends about how best to respond. Last week Pope Francis entered the conversation, as always with a challenging point of view. In an interview for what would once have been thought a decidedly unpapal forum — Scarp de 'tenis, the Italian equivalent of the Big Issue — he recommended always giving coins to people who ask for money on the street. Dismissing the most common reason offered for refusal — that the money will only be spent on alcohol or other drugs — he asked how we spend our own surplus money. He added that the most important part of giving to the poor is to engage the recipient personally and to enter imaginatively into their situation. He also spoke of the duty of society to provide for shelter and the basic needs of all its members, and to make migrants and refugees welcome. Francis' advice recalled the legendary Melbourne Archbishop Mannnix's practice of walking into the city each morning and giving coins to people who asked. "Any principles that shift our attention away from the human being before us are evasions of responsibility. It is dehumanising for us as well as for the person who begs from us." To many it will seem to be too categorical. The more interesting point, however, is what underlies his dismissal of principled reasons that permit you to pass by without responding to the person who asks. Our principles leave us in control, with an unbridgeable gap between ourselves and the persons who beg. The humour of the story makes the serious point that we all have one skin, and that the implicit difference between us and them is trivial compared to our shared human dignity and frailty. Furthermore, any principles that shift our attention away from the human being before us are evasions of responsibility. It is dehumanising for us as well as for the person who begs from us. We must constantly renegotiate our principles about people through uncontrolled encounters with the persons themselves. That is true of the principles that form our personal policies. It is also pertinent to public policy that affects the vulnerable: homeless people, people seeking protection, and disadvantaged young people in the justice system. It is easy to look at the big picture, at the economic and political situation, at the need to allay public disquiet, and to impose a solution. This is then left to the officers of government to administer by implementing the principles inherent in the policy. Asylum seekers are to be deterred, young offenders to be locked up and the homeless kept out of sight. Of course governments and their officers will also want polices to be administered correctly and humanely. The problem is that humanity and correctness are defined within the limits of that policy, not negotiated through meeting the people affected by it. If the policy itself is inhumane, the great human suffering and alienation that result from it will be seen as by definition acceptable. Policy will have then made invisible the harsh reality of people's lives and its causes. As has so often been the case, Francis' throwaway lines about giving money to those who ask us illuminate much larger social issues. All Jesuits including Pope Francis, know how St Ignatius gave his rich clothes to a beggar. In the interview the real Sr Lucia, (not the smiley one) http://www.traditioninaction.org/HotTopics/g12htArt2_TwoSisterLucys.htm gave to Fr Augustin Fuentes on the 26 of December, 1957. "What was coming," she warned," was a decisive battle between the Devil and the Blessed Virgin, where souls of the faithful would be abandoned by the religious authorities, ( hmmm sound familiar?) and added," we should not wait for Bishops in our Diocese, nor should we wait for the call to do penance from the religious congregations, each person would have to save his own soul"...I always stop to chat with Ray when I see him asking for money in the mornings. Sometimes I bring him a coffee and a choc muffin. He prays to Jesus for me. He's part of the Hillsong crowd. 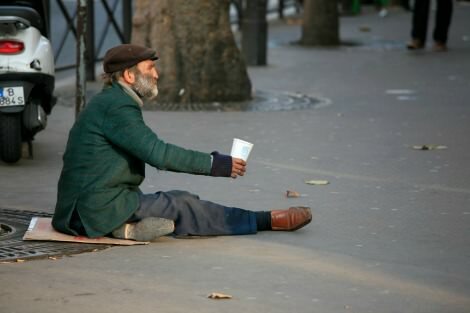 I always give a dollar or two to beggars, look them in the eye and say, "There you go buddy." I believe, I even feel that, there but for the grace...go I. A thoughtful article Andrew. Pope Francis has a certain humility and compassion not evident since pope John 23rd. My father knew Daniel Mannix quite well and he told me that he was once arrested on a British ship for treason. "He caused offence amongst non-Irish by referring to the War (WW1) as "a sordid trade war" and made light of criticisms of his earlier appointment as Catholic Chaplain-General, speaking of "the disgrace and obliquy attaching to . . . putting on the King's uniform". (M. Gilchrist - Wit and Wisdom) He was courageous and outspoken. My only memory of him was filing past his body when it lay in State at St Pats as a schoolboy from St Johns Hawthorn. He was asked once what he thought the Irish had contributed to Australia and he quipped "gambling and drink." One of the things Jesus was constantly on about was the theme of personal responsibility. I would contend he trumps both Pope Francis and the late Archbishop Mannix. Australia has recently seen the rise of a figure common in parts of Asia and Europe: the professional beggar. There are a lot of poor people out there: many are the working poor who subsist on some sort of Allowance and possibly limited hours of part-time work. These people often go to charities, where their claims for help are vigorously scrutinised, in order to pay recurrent power bills. The St Vincent de Paul Society do excellent grass roots work alleviating poverty at the coal face. They do not just hand out money on demand but actually check people's situations before deciding on how best to help them. Just accept a hypothetical: what if you know a panhandler is not genuine? It's your responsibility: no slick sermon can substitute for that. Aye, there's the rub. Edward, if a person's circumstances dictate that their best employment option is 'panhandling', as you call it, (dreadful term) that seems pretty genuine to me, in which case give the worker what's due. The far bigger concern is that such is the increasing level of economic distress for so many people, as I walk through town I invariably run out of money before I run out of people in need of it. I can only pray the shortfall is made up by folks attending to Francis' message. The story is told of a rabbi and his young son who, while walking along a sidewalk in downtown New York, encountered a seated man wearing dark glasses and carrying a white cane. Placed by the man’s feet was a sign requesting donations. The rabbi gave his son some money which the boy duly placed in the man’s collection tin. A little later the rabbi said to the youngster, ‘You didn’t raise your hat to that man.’ ‘He is blind,’ protested the boy. ‘He wouldn’t see me do so.’ ‘But he may not be blind,’ replied his father. Thank you for that. I will now try and be more charitable towards beggars. Well last conversation I had in the city, a young guy told me it cost 36 bucks to get a bed and a shower at an easily accessible drop in place in a suburb a train ride away. 10 bucks is needed for a bond that is returned. He hadn't had a shower and a bed for more than 4 days and really needed one. It had been a while since he had anywhere near that much money. It is expensive even being poor and homeless in Melbourne. Give if you have it and get political this is a system problem.I have to say I loved what Pope Francis said ...it takes all the judgement out of it and leaves a choice about whether you can be compassionate and /or generous or not. Alexandria, I wonder if your beggar from the Hillsong crowd gives 10% of his takings to Hillsong. To belong to Hillsong it is compulsory to give the biblical 10% tithe to the organisation. If a member does not pay the tithe they receive very short change indeed. Pope Francis wants a 'Poor Church for the Poor'. The challenge for all Catholics is to do what we can both individually and collectively to see that this happens. Otherwise people will continue to move away from our Church, because they don't find Christ there. Hi John, l'll ask Ray the next time I see him in his wheelchair.. I did ask him once what does he do with the money people give him. He mumbled something very quickly back. Last year I accompanied him into his bank, just down the road from where he sits in the mornings. He was very upset about 'they' taking all his savings. He had asked me to please take him there. I will keep you posted. While I am an admirer of the Christlike Pope Francis, Grant, a "poor Church for the poor", a church with no money, is unlikely to help those who have none and need money to survive and live a reasonable life. Slogans are not likely to help either. Sometimes it seems that Pope Francis needs to address reality as Jesus did. I agree with Pope Francis' suggestion that we both give a donation and speak pleasantly with those who ask for our help. My problem is, I don't do the shopping, so I don't get change. all I buy is diesel, and I do that with a card. I keep $5 for church and I use $2 a couple of times a week to go to the swimming pool. So my $5 notes and $2 coins are my most precious things. I often "lend" money, maybe $20 or even more, to someone I know, maybe to someone who rings me up and asks for it. To people I don't know I say, truthfully, I don't carry money round with me any more because too many people ask for it. Policy is formulated in a secular environment by people, some of which may have no christian beliefs or personal sense of care, motivated by the pay packet and the status of their bureaucratic role. They may be far removed from the coal face where laws, (acts and regulations) are implemented. Diffusion of responsibility theory explains how people reconcile turning a blind eye to their responsibilities. Thanks Andrew.I have always taken the view that it is better to give than not to because to give a few coins even gold ones will not impact on my living standards but hopefully improve the other even if the money is spent in a way I may not approve.Another option is to take the person asking for a meal if they say they want to buy something to eat. This happened on a number of occasions in Swanson St opposite St Paul's Cathedral in Melbourne when I was on early Mass duty. “As has so often been the case, Francis' throwaway lines about giving money to those who ask us illuminate much larger social issues.” And sociology-of-religion issues too. Once upon an imaginary time, a despondent couple in an irregular marital relationship sat hunched on the pavement, looking hopefully at the Roman Catholic priests tentatively walking past (rather like priests and levites passing a victim of robbery on the Jerusalem-Jericho road) hoping for an invitation to Holy Communion. A street-smart pope from the slums of a major Latin American city stopped to look them in the eye. He said, “I know married Catholics in a second union who go to church, who go to church once or twice a year and say I want Communion, as if joining in Communion were an award. It's a work towards integration; all doors are open. But we cannot say from here on they can have Communion. This would be an injury also to marriage, to the couple, because it wouldn't allow them to proceed on this path of integration.” The street beggars need integration. Coins can only be a start. Coins on their own block integration, just as, apparently, Holy Communion on its own. I am not a Christian, but hold to many of its tenets, and often agree with Pope Francesco. It is difficult dealing with "beggars". Some I will give to; some I won't. Not, for example, to the aggressive woman who moves from the tobacconist to the steps of the church each morning, and berates those who do not give. But to another woman who sits at the same church steps but who--unbeknownst to most in my neighbourhood, spends her spare hours picking up rubbish on the streets and puts them in a bin. Unasked for, and unsung. So I do make a choice. This article, and Francesco's words, will make it certain now that I do engage with the second woman but not, perhaps uncharitably, with the first.. My income is small, I keep coins aside, but I do make choices. complex issue for the soul. the disability pension is over 800$ pf add to this begging revenue,no rent from living on street, free food charities etc. survival of the fittest at work! I give to buskers and people begging (I don't meet so many these days). It isn't my job to be judgmental. what they do with the money is their choice. Roy, there are no sin detectors at the door of the church I attend - a good model for society in general. "there are no sin detectors at the door of the church I attend - a good model for society in general." Aurelius, there are no sin detectors at the door of the confessional of the church that you attend either. The priest sitting in the confessional has a sin detector but it only works when someone walks into the room to push its button. But how would that someone know when to walk into that room to push that button? Perhaps by listening to what a pope might say to the assembled media at the back of his aircraft? Roy, the pope isn't absolving people of responsibility for their sins. On the contrary. He is reminding the whole of society to be compassionate - because the sins of the divorcee, or the gay person are not unique and shouldn't be singled out for specific mention. I admire your kindness and humanity Lisa but I am a wee bit concerned you seem to think panhandling (a word originally from the USA which admirably fits the situation) is a valid employment option. Fortunately in Australia we still have a social security net. Sadly that has been tweaked by the bean counters in terms of saving money rather than lives. The young are indeed most at risk here. I like the social security system in the Scandinavian countries and Northern Europe. In Denmark, if you really can't work, due to age, disability or any other valid reason, they will look after all your needs properly. The catch is that you can't have the sort of assets some of our social security recipients here have. There's the rub. Having spent a considerable part of my life working with the long term unemployed and especially disadvantaged, I know many families on both social security and low incomes do it hard. It is interesting in Islam, where there is zakat, or a wealth tax on those with reasonable assets, the Prophet Muhammad urged any able bodied person not to beg but to do work, any work. Of course, these days work is fast disappearing for many. I dread to see a Melbourne like the Cairo it resembles these days with its plenitude of beggars. Surely our politicians could do something about that? Oops, sorry. All they seem good at is claiming their entitlements. I asked Ray this morning if he gave 10% of his money to the Hillsong crowd. He said, ''no'' he puts all his money in the bank. "I asked Ray this morning if he gave 10% of his money to the Hillsong crowd. He said, ''no'' he puts all his money in the bank." Good luck to Ray. What's wrong with crowdfunding without an internet connection? If people want to know why he's begging instead of selling Big Issue, when we have a social security system, they can ask him and in doing so get a relationship happening. No harm done if both the asking and the giving are consensual. Quite right. Be wary about offering to buy person meal. It can sound so patronizing, as if they can't be expected to feed themselves properly. Price of meal might buy 5kg apples.(Ex). and also raise the ugly spectre asking "what does this person want in return for buying me this meal? I have to put up with them watching me eat? Struggling with inadquate dentition. Must I meanwhile endure being questioned about the hows, whys, wheres and how much does it costs of my alien existence? Many respond to this offer with abuse. How odd but it lets you walk off with your head high knowing that at least you tried and "did you hear what she said?" and a dinner party story to bore your friends and relations for at least as long as it takes for the next outrage to occur. Only thing certain they will have heard it before or even told it themselves. What the sharia is all the fuss about? Once upon a time, a proud dad in Dandenong could name his son Jihad, with its ancient meaning of 'striving' in the path of God. Now he might choose a different name to avoid future discrimination. 'Shari'a' has come to mean the forced imposition of medieval punishments on cowering populations, while 'halal' is the torture of sheep and cows. These words have been stolen from ordinary Muslims, the vast majority of the world's second largest religion. I blame three groups for this.